History is probably the most popular scientific domain in Poland: “we, the Polish, care too much about history”, writes one surfer in his post. Popularity of history is evidenced by the astonishing number of historical books available on the market and thr numerous printed monthly magazines such as: „Uważam Rze. Historia”, “Zakazana Historia”, “W Sieci Historii”, „Historia. Focus”1, „Historia. Newsweek” etc. All of these magazines are represented also on internet (http://historia.newsweek.pl/; http://www.wsieci.pl/aktualne-wyda too nie-sieci-historii.html; http://www.focus.pl/historia/) where we can find a lot of specially designed portals and sites devoted to history; among them are also private pages (including blogs): http://historia.org.pl/ ; http://polskiedzieje.pl/. Moreover, history is present as an important and visible topic in socio–cultural portals, such as Onet.pl or Wirtualna Polska.pl, where surfers always comment the published materials. However, these discussions are not very sophisticated, sometimes more than 200 comments revolve around peripheral, but sensational or funny issues. For example: following the CNN news, a short note accompanied by audiovisual narration and entitled “Mysterious discovery. The first of this kind in the history” was located on the Onet.pl and inspired the discussion about dogs and cats in our everyday life (the news was about the part of figure of sphinx found on Asian side of Mediterranean See, “the first sphinx outside Egypt”, August 8, 2013). Some of the sites mentioned above are typical educational sites, e.g. http://polskiedzieje.pl/2. This portal is almost without any comments; the forum is inactive, even on its facebook version. The articles present mostly „school” or „textbook” kinds of knowledge. The portal seems to be designed just for repetition: maps, “galaxy” of Polish kings and princes, bare facts in rather descriptive articles with neither discussion nor interpretation. Fig. 1. 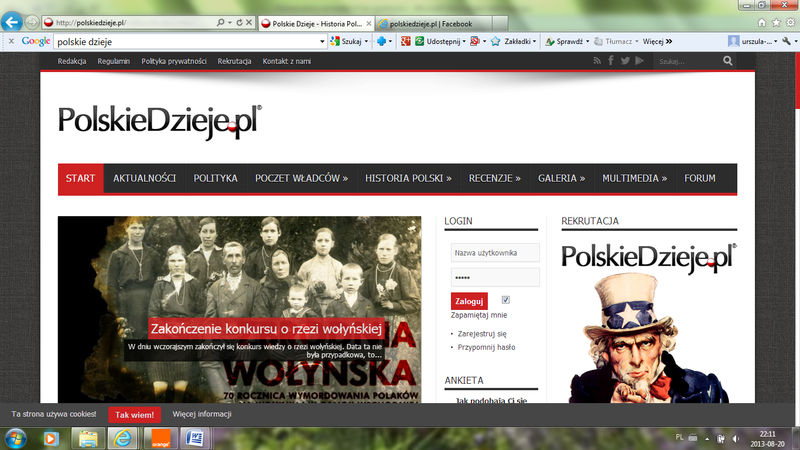 The print-screen of PolskieDzieje.pl with the material on the Wolyn crime and visible advertising using “uncle Sam”. Polish national history is a matter of scientific research in a lot of Polish universities and institutes. Dealing with the newest past is the task of the special Institute of National Remembrance (Instytut Pamięci Narodowej, IPN) which grasps the content of institutional archives opened after the end of communism (http://ipn.gov.pl/). The internet site of this institute is popular not only among researchers but also among politicians and statesmen; it is also available in English (http://ipn.gov.pl/en). A lot of educational materials are published here. The newest past means the almost 50 years of communism in Poland, that began in 1944 in the East of Poland with the liberation from German occupation by the Soviet army and Polish armed forces created on the territory of the USSR. During the People’s Republic of Poland3 period history was a political issue. Nowadays it seems that history could also be treated as a special tool (or weapon) for gaining political power. The old saying tells us that “History is written by victors”, although in Polish case we can paraphrase it into “history is written by victims”. The turn in 21st century is accompanied by changes in conceptualizing the past in our neighboring countries, and it seems to be crucial to understand the problems of politicization of the past. Another institute similar to IPN is called Ośrodek “KARTA” [Center Karta], and it is devoted to analyzing the newest history of Poland: materials collected by researchers such as photographs, documents, memories are available also in the net; “Karta” has its own site on the facebook (https://www.facebook.com/OsrodekKARTA). And again, this site is more for education then for discussion, although there are some opinions on the site. The information about Polish history can be obtainable also during the search for touristic purposes. The main cities in Poland provide on their internet sites popularization of their attractions, including historical ones (e.g. http://krakow.pl/spacer). One can learn about the city past, about the commemorative events and entertainment based on history (such as reconstruction of historical events), but the city pages usually do not offer the place for discussion about history. Methodology. This research applies the method of multiple categorization, discourse analysis, and snowball sampling (Babbie 2011: 208; 356). The moderators of YouTube, authors of historical blogs often provide links to the other blogs or historical sites (please follow the links here http://history.blox.pl/html); snowball effect is almost obvious when it comes to search the YouTube resources. However, the magnitude and dispersion could affect the results. To enrich the background of discussed issues some comments on historical events and their media representation are added in the narration. Fig. 2. Logo of the forum “historians” (“historycy”). Forum http://www.historycy.org/ is devoted to historical discussions among students, teachers, amateur history admirers etc. The name “historycy” means historians. The forum is connected with Maria Curie-Skłodowska University in Lublin. The portal “historians” is devided into 5 parts: world history, history of Poland, history of art, electronic library (Biblioteka Cyfrowa Historycy.org), areas of historical studies and “forum” (means varia, cross historical subjects). In every site and section there is a possibility to publish an article, and a lot of topics are constructed from the materials chosen by the users, sometimes also written by them. “Topic” can be only the question for discussion; and as moderators wrote: the users had written totally 1 223 061 posts4. On the forum were active 83 390 registered persons. The greatest number of the surfers online – 1 794 – were active on August 27th , 2012 at 21:28. Moderators published detailed information about users, e.g. the number of active “historians” members during last 15 minutes (daily about 230, nightly – less, the level of users’ activity depends on the season of year), who’s birthday is today, and how old the user is (according to profile). Their statistics were used to prepare the following analysis, especially presented on the site the numbers of posts and topics in general. It is worth noticing that the name of a person responsible for a given forum is always mentioned; the moderator of discussion is often recognized only by his/ her nick: P. A. Hadrianus, Anders, sargon, szapur II. The users and moderators often choose their names after famous historical figures. The following analysis is mostly focused on the crucial problems the discussions are about. Considering the amount of texts to potential reading, it was necessary to select the material and popularity of some topics seems to be an appropriate key there. On the forum on the world history users wrote 306 366 posts to 14 656 topic, what constitutes about 20 posts per topic. Statistic is here only the orientation point, the key figures are used to support the other data, such as the content of posts and dynamic of discussions. From combination of qualitative and quantitative date it is possible to distinguish between historical epochs on the basis of their popularity on the forum. The most popular historical topic here and on the other fora is WW2 and chosen topics from contemporary history. Interesting is also comparison of general subjects for discussion on the forum on the Polish history. Table 1. The data on the users’ activity on the forum “historians” (August 20th, 2013). The most popular – in the light of number of topics and number of posts – is the forum on World War II. This forum is introduced by moderators with their interpretations of the war events: “War broke out on 1 September 1939 after the attack of Nazi Germany and Slovakia, in agreement with the Soviet Union to Poland. Traditionally, the entry of German troops into the territory of the Free City of Danzig/ Gdańsk is treated as the first attack and the first day of war (although, in fact, was the first city in Poland bombed was Wieluń, not Danzig/ Gdańsk)”5. Subfora here are more concrete than in the previous epoch’s fora: The Third Reich and the Axis, the Allies west, the Soviet Union and Eastern Allies, Weapons, mass destruction, world under occupation, Poland 1939-1945, Biographies, World War II – secrets reinforcement, World War II in general view. The second place in the above classification belongs to the ancient history section. The forum is divided into subfora such as: Human Prehistory, Mesopotamia, ancient Egypt, Babylonia and Assyria, Syria and the Levant, Minoans and Mycenaeans, Persian Empire, archaic and classical Greece, Alexander the Great and the Hellenistic era, Celts, Teutons, Rome, Carthage, ancient religions, Ancient War, Society and economy in ancient times, antiquity generally. Medieval times seems to be also very interesting period to users (3rd place in the table), there “historians” can discuss on the subfora: Kingdom barbaric; Byzantium; Islam in the Middle Ages; The Holy Roman Empire; Italian City–State; Vikings and Normans; The Crusades; France and England – the feudal rivalries; Slavs and Hungarians; Medieval War; The popes, saints and heretics; Society and economy in ancient times; Middle Ages in general. So, these sections are almost as popular as previously mentioned WW2 forum. In order to support the data with some details from the fora, let us focus on a brief analysis of a typical discussion chosen from the forum “Ancient Times”, subforum “Celts”. The topic “Druids” begun in September 2006 and ended in April 2012. The users put only 54 posts here, what could signify rather slight interest, however the topic has been followed 17 679 times. Generally speaking, the posted opinions constitute a kind of peaceful exchange of opinions and information started by “Aquarius” who asked the question: “Druids – priests, philosophers, sages, theologians, magicians. Who exactly they were? What was their role in Celtic society, and what do we know about them for sure?” Surfers try to describe and discuss Druids customs, the social status of the cast, and character of their religion and rituals. People simply send their posts, and, probably they follow the discussion avoiding active participation. How do users react to the opinions and comments of others? The active user called „agniechabed” 8 times took part in the discussion sending the useful data referring to Cesar and his works: „Druids together with aristocracy played a leading role (according to Cesar). None could be born as a priest […].Druids were generally recruited from aristocratic strata, and candidates to that caste reported themselves or were assigned by their families. A votary often spent 20 years on the teachings for priesthood, extremely hard 20 years. The knowledge was transmitted only in oral way, it means that one should memorize everything, i.e. mysteries of faith […], obviously – all forms of fortunetelling, the calendar, art of medicine, the basis of law etc. […]”. In her post “agniechabed” mentioned the rituals of human sacrifice and the notion started the discussion of that issue. The post also initiated a discussion on the special training for priests; surfers tried to find why it took so long to teach somebody. Another motif caused vivid exchange of opinions was connected with the women-priests in the Celtic culture. Moreover, inn several posts users also analyzed the origin of Celtic writing and the evolution of scripture; and some users wrote about political life, the battles and about Celtic gods. Portal provides also two fora on history as such, devoted to very general topics: “History in general” and “Historycy.org for English users”. The first one in fact has only one forum on alternative history, and it is quite popular – 4th place in the classification. The second one is advertised as really very general for people who do not know Polish history at all: “The Polish state was born in 966 with the baptism of Mieszko I, duke of the Slavic tribe of Polans and founder of the Piast dynasty. His conversion from paganism to Christianity was Poland’s first recorded historical event”. Two fora are active here: History of the World, History of Poland. The results of analysis grasp the popularity of a given forum or lack of interest but not the causes of it. Let us present also not so popular fora. The forum’s section of “Contemporary history” (9th place in the table) deals with the history after WW2, although there is another forum on the newest history called “World after Cold War, and 21st century” (5th place in the classification); so, the periodization is not very clear in this case and can be confusing for the users. Categories are not disjunctive and well defined, and it is understandable – all is produced by amateurs who called themselves “historians”. Topics can be similar in the above fora, although the latest one is devoted to the political and military aspects of history, it provides subfora on: Decolonization, the Vietnam War, Western Europe after 1945, The Cold War 1945-1989, 1945-1990 People’s Democratic Countries, Middle East until 1989, Far East to the beginning of the 90’s, post-colonial Africa, socio-economic changes after the WW2; contemporary world history in general. The forum was created to comment chosen historical processes and civilizational changes we have been witnessed, just like cloning of Dolly, Gulf War (1991), Balkan War (1999) or Chechnya (1995-1996). There are also subfora: The collapse of communism, the United Nations, Wars and conflicts, Heads of State and historical figures, states and empires, The world after the Cold War in general, society and the economy after 1990. History of the 19th century is treated as the history of ideas more than history of very concrete period of these 100 years (6th place in our classification). Moderators claim that „we consider the 19th century since the establishment of the United States and finished in 1914, with the beginning of the First World War” (http://www.historycy.org/index.php?showforum=91). Subfora here are also well structured and users can discuss more general topic of: the Birth and expansion of the United States, French Revolution, Napoleon’s Europe and the revolutionary war, Apogee empires – colonial conquest; Unification of Italy and Germany, sc. “the Eastern Question” (colloquially mentioned in Polish as “kwestia wschodnia”), and deals with the Balkan states, the decay of the Ottoman Empire and the consequences of it to the world history, etc. ; Latin America and the independence, American Civil War, Scandinavia in the nineteenth century, the nineteenth century in general, socio-economic changes in the nineteenth century. Names of moderators here are sometimes too colloquial (as “ciołek”, what means the stupid one) or too mysterious or sophisticated (like nick “Sarissoforoj”, which is connected with the ancient Greek army history). Some of the users’ names are rooted in Polish traditional discourse in which one can also identify so called “new speech”, official language form typical for communist powers in Poland. Separate forum is organized for discussions on “World War 1 and the Interbellum” (8th place in the table), and this forum is also of medium popularity. Users can write on subfora such as World War I, the Russian Revolutions, the League of Nations and the post-war order, The Great Depression, The Birth of Fascism and the road to World War II, society and economy in the years 1914-1939, period of 1914-1939 in general. Although the forum is relatively small, three persons moderate it. Moderators located the topic of other civilizations developed in ancient times in classification just after the Middle Ages forum. “Other” means here non Western civilizations, and it is not very popular forum. It is structured also in subfora, users can discuss topics such as: China before the Mongol conquest, the Mongol conquest of China by the Manchus, Mongol Empire and the great steppe civilizations, India before Islam, Southeast Asia to the nineteenth century Muslim India, Japan to the twentieth century, pre-colonial Africa, Civilizations of America, pre-colonial Australasia and Oceania. This small forum has only one moderator. In an information table with statistical data moderators gather together all the periods from Renaissance to the end of XVIII century under the name of “Modern times” (7th position in the table). Subfora here are devoted to: Geographical discoveries, Reformation and Counter-Reformation, The Ottoman Empire; the Empire of Spain and Portugal; United Kingdom XV-XVIII centuries, Dutch Republic, France and Louis XIV, the expansion of Russian colonial expansion in the seventeenth and eighteenth centuries; Scandinavia Modern, Modern Wars, , Society and economy in Modernity, Modernity as such. On this forum users wrote 15 603 posts to 1 222 topics, so it means that per one topic surfers wrote circa 13 posts. In fact the result to the discussed forum is quite good in comparison to the total quantitative results of the whole forum “historycy”: as it is clear from the results – users react to single topics writing average 20 comments. It is worth mentioning that similar forum is designed for discussion and repetition for students on the site “historia” (http://historia.org.pl/). “Historia” – history itself – consists of articles, photos and other materials as well as competitions, galleries etc. Fora here are also very popular among surfers. Before discussing the issues connected with the “alternative history” represented in the short film THIS COULD HAVE HAPPENED or how Polish beat Hitler and Stalin; some introductory remarks are definitely needed because the beginning of the World War Two from Polish perspective is not very popular in Europe (Davies 2007: 6-14). While discussing the media’s portrayal of the September Campaign of 1939, when Poland valiantly and alone faced attacks from both Nazi Germany and Stalin’s USSR, it is necessary to mention the alterations to the political context in which societal memory of that campaign was created. The initial images of the September Campaign display the sufferings of a society taken by surprise at the military aggression of its neighbors from the west and from the east. One of the most interesting examples is the film Siege by Julien H. Bryan (http://www.youtube.com/watch?v=C8eAmFrPS7U), an American photographer and cameraman who stayed in Warsaw during the first weeks of the war6 (cf. Sawicki, Stempowski [eds.] 2010). The film offers a poignant, heart-wrenching image of people struggling with the consequences of the siege – that is, with living in ruined homes, with shortages of food and water, and above all with the unexpected and unjust, as it was seen, death of their closest, including small children and young people. This 10-minute reel shows only the siege of Poland’s capital. The narrator informs us of the incessant bombings, the conflagrations across the city, and the lack of food and water. He focuses on the common life and the people’s suffering never even touches on the movements of military forces or events on the eastern border. When we bear in mind the balance of military power on September 1, 1939, when Germany launched its war against Poland, the advantage of the German Army over the Polish army is altogether apparent: “The Wehrmacht possessed a marked supremacy – as Norman Davies put it – especially in tanks and modern aircraft: 55 German divisions and 1,500 warplanes lined up against 39 Polish divisions and 400 aircraft. Both sides deployed large contingents of cavalry, of horse artillery and of horse-drawn transport. The result was not the hopeless walkover that is often portrayed. Indeed the Poles performed rather better than the British and the French were to do when Hitler turned west in the following year” (Davies 2007: 77). During the first two weeks of the fighting Poland suffered enormous losses. This weakened Polish army attacked from the west now had to face yet another enemy – the Red Army, whose units entered Polish territory (without a declaration of war) on September 17. The pincers the Polish army then found itself in because of the Ribbentrop-Molotov Pact meant that the debilitated Polish forces did not have much chance in fighting a two-front war. The joint celebration of victory by the Wehrmacht and the Red Army in the city of Brześć (175km east of Warsaw), and the presence of Hitler himself on a parade in Warsaw – these are the events that sealed the failure of September (cf. Davies 2007: 6-7). However, the most common image (not incidentally, the one projected by the media) is still that of the war with the Third Reich. Publications like 1939 IV rozbiór Polski [1939: The fourth partition of Poland] attempt to incorporate events regarding the Soviet invasion into the existing memory frame (cf. Gluza, Markowska et al 2009). In 2007 Andrzej Wajda’s film Katyń was released. It focused not so much on military operations or the way attitudes were clarified during the fighting as on the atrocity the Soviets committed on Polish officers. Thanks to this film one of the gaps in the visual memory of the war was at least partially filled (the topic will be also discussed below). Thus, September 17, 1939, a date of surpassing national tragedy, was not mentioned during the years of the People’s Republic of Poland. It was simply unthinkable to pass on information that Soviet armies had invaded Poland’s eastern territories (Cohen 2001: 138; Jankowski, Miszczak 1990: 5-7; Markert 2009: 113-116; Melak 1989: 7-8). Polish collective memory of that episode of World War Two has not been integrated into a grasp that includes the other battles and events of the September Campaign – thus, the interpretation of September 1939 is not complete. This state of affairs was wrought above all by political circumstances: the USSR presented its version of events, and this became the basis of indoctrination in postwar Poland. Moreover, that version was also recognized by certain Western scholars as credible (Davies 2007: 6-8; Melak 1989: 8-9). On the background of above information is good to discuss the case of the reception of one “alternative history” film. The short docu-fiction is a part of collection of What if…? : THIS COULD HAVE HAPPENED or how Polish beat Hitler and Stalin has been available on YouTube since May 13th 2009 (original spelling of the title, (http://www.youtube.com/watch?v=1tHH0kfJi3c). By more than 4 years of presence in the net the document had been watched more than 500 000 times and gathered 3 639 posts. This case is interesting for a few reasons: 1. the posts are prepared not only in Polish – we can find also Russian- and English-language comments; 2. the level of aggression in the comments is significantly higher than in the other posts published on the all examined for this research fora; 3. the spectrum of negative attitudes to other users is worth analyzing, it is easy to group them in special types, and I’m going to show that (at the end of the article). The comments of mentioned user are still visible despite the protests of the other surfers. Some of Polish users were also vulgar in their answers to “WehrmachtHD” and tried to offend him using epithets such as “nazi”, “German fascist” and “dirty” language. спасибо поржал..)бедные поляки мне их жаль. „Language of hate” is also typical for a lot of Polish users’ posts here. Surfers write against the other users, against Germans, Russians, and surprisingly – against Jews. A lot of comments were blocked and some were removed from the forum, it is hard to imagine what was written in those posts using the perspective of the visible comments, which are more than “extreme” in expression of hate and disrespect to others. A stab to the back (1997) was published on YouTube in May 24th 2013. Up to the end of August 2013 the documentary has not provoked any reaction from the viewers (only 1 860 people had watched it; the same movie was published also by the other user and has only 4 comments: http://www.youtube.com/watch?v=4YvNVuNMlIA). This film was also popularized on TVP Historia, and some posts occurred there. Fig. 3. The print-screen of YouTube movie Cios w plecy (A stab in the back) accompanied by ads. In Polish collective memory still open wound is that of the Soviet invasion of Poland on September 17, 1939, which Poles remember as “a stab in the back”, “Poland’s fourth partition”7, and as the “zdradziecka” invasion – a word which connotes ‘treachery’ and ‘betrayal’ and bitterly plays on the word ‘radziecka’, which means ‘Soviet’ in Polish. During the postwar People’s Republic of Poland (which lasted until 1989) the Soviet invasion was essentially absent from official discourse, nor did it meet with artistic portrayal of the kind that strengthens not only popular imagination, but historical awareness as well. Indeed, Polish culture has no universally recognized, accessible, and solid literary or film narrative on the topic. Rather, the Soviet invasion appears as a side motif in literature and film productions. Book publications and documentary films that try to grasp September 1939 as a whole have been appearing on the official Polish market for several years now, and usually they evince an incomplete and dummied-down scope. One relevant example is that of the slim third volume of the series II Wojna Światowa: Kolekcja [WWII: the collection], entitled Atak Sowietów na Polskę [The Soviet attack on Poland], which devotes more space to the armaments of the Soviet formations than to the invasion itself. The book also includes information about the Katyń massacre, which was a consequence of the invasion. However, the film that accompanies the book fails to address Katyń at all. One of the worst open wounds in Polish collective memory is of course the mentioned Katyń massacre, whose absence in official, academic, popular, and media discourse has its roots in the silence surrounding the Soviet invasion of September 17. Throughout the years of the PRL it was forbidden to speak openly of either matter. Thus, within societal awareness a “whispered” truth arose, one that was often repeated in private conversations, and also propagated in the illegal press, that is, the materials produced by the opposition abroad, and which could not always pass through the Iron Curtain to Poland. It was from that body of material that one of the more important works on Katyń hailed: Katyń – zbrodnia bez sądu i kary [Katyń – a crime without trial and punishment], written by Józef Mackiewicz (1989), who witnessed the first exhumation of the officers in the Katyń Forest in 1943. Although his book was published in 1948, it has been officially published in Poland since the 1997. Memory of the World War II was strictly politicized in Poland: the problematic events such as the USSR’s attack of Poland in 1939, the Katyń massacre of 1940, and the Warsaw Uprising of 1944 never enjoyed a fitting media presence and were never the narrative forge for shaping society’s awareness that the German occupation was. In the case of the Katyń massacre, as early as the 1940s the truth had become a “prisoner of war” held by the victorious Soviets – a prisoner of the very regime that had committed the atrocity. For long decades the Polish side – especially Polish émigrés who opposed the system imposed upon Poland by the USSR – endeavored to disclose the facts concerning the disappearance of Polish soldiers in 1940. Norman Davies writes: “…Nothing had been done, for instance, to clarify the fate of the 25,000 Polish officers missing since 1940 in Soviet captivity. The Western Powers, increasingly beholden to the USSR, were apt to let such matter lie – or even, by permitting the rising tide of Soviet propaganda, to allow their loyal Polish ally to be slandered” (Davies 2007: 181-182). Katyń massacre is still present in the public sphere, one can read the information about it in Wikipedia: http://pl.wikipedia.org/wiki/Zbrodnia_katy%C5%84ska. Information pertaining to the atrocity is also available on the sites moderated by families of the killed officers, e.g. : http://www.katyn.org/; http://www.katyn.org.au/beria.html. The Institute of National Remembrance also provides data in the net: http://katyn.ipn.gov.pl/kat/publikacje/3646,dok.html. The history of the crime is available also at: http://www.pamietamkatyn1940.pl/; the site with English language version and also at another site designed for popularization the truth about Katyń among foreigners. Fig. 4. The print-screen of Pamiętam. Katyń 1940, the site devoted to the description of the massacre and presentation the truth to the Polish as well as international public. Fig. 5. The print-screen of the site “Katyń Crime” dedicated to the commemoration of the victims of Katyń massacre; the site is in English. Hard data or soft interpretation? In Polish language web, popularity of the WW2 is typical for every portal and site devoted to history as such. There are also special portals prepared for delivering the information and interpretation, visual materials on well known facts as well as on quite forgotten events and heroes. One of those portals is okupacja39.pl, which gives also the space for discussion on a special topic. Almost all mentioned portals and fora have their facebook “mirror” page (e.g. https://www.facebook.com/okupacja39). So, some discussions can be visible on both – facebook and the other, specially designed pages. Fig. 6. The print-screen of the Facebook page for okupacja 39, the portal devoted to the historical analysis and discussion of the whole period of German occupation of Polish territory during 1939-1945. When Polish popular awareness up to 2013 is examined it is possible to distinguish several phases of interpreting wartime experiences (I shall describe two) and to indicate further gaps. In the case of films we may distinguish several phases of war-narratives that go hand in glove with the trends in the PRL’s propaganda. The first such phase took place between 1945 and 1949. Cinematographic work was carried out on the rubble of the earlier studios, and was not under the thumb of the political authorities. Among the more important films of that brief period was Zakazane piosenki [Forbidden songs] from 1946 (dir. Leonard Buczkowski), and the outstanding production Ostatni etap [The last stage, 1947, dir. Wanda Jakubowska], which was filmed the following year in concentration camps and thus boasts enormous documentary value. The second phase I wish to discuss is connected with the “Polish School” that flowered in 1957-1963. The work of this school evinces several characteristic features, particularly romantic, realistic, and psychological trends. Of the 138 feature films produced in those years some 30 of them are attributed to the Polish School. One of them was Lotna (1959), the highly criticized film by Andrzej Wajda, which portrayed the commitment and determination of the Polish cavalry in the September Campaign and the symbolic farewell to Poland’s Second Republic of 1918-1939. The other feature films about the war focused on military operations, which are by nature difficult to interpret, although important in shaping historical awareness. Things are similar in other media that serve memory. For instance, one of the aims of the first and second phase of telling the story of the war was to glorify the Red Army and cement its image as the liberator of Poland. Closely related was the aim of deepening the hatred for the Germans who had occupied Poland. This motif was very powerful and predominated until the close of the 20th century. The second phase brought other voices to the fore, for example, concerning the event that had been taboo in official memory: the Warsaw Uprising of 1944. The political discomfort the Uprising caused the authorities of the PRL pertained not only to the Home Army’s anti-communist credentials, but also the failure of the Soviets (now allies) to have responded with support. After all, having called upon Varsovians to rise up against the Nazis, the Soviets then halted their swift advance westward and stopped just outside Warsaw’s eastern districts. From there they idly watched Warsaw burn and its inhabitants perish. Of course, the Soviets were waiting for the city to fall – and in this regard we may observe a repetition of the scenario in September, 1939. The Soviet decision not to aid the people of Warsaw was seen in émigré circles as treachery, as yet another Russian stab in the back against the entire people of Poland. Among the more important films that took up the Uprising were Andrzej Wajda’s 1956 Kanał and 1958’s Eroica by Andrzej Munk. Here too are we dealing with wounded memory, as the soldiers who had fought in the Uprising were later persecuted in the PRL (cf. Strzembosz 1996, Ciechanowski 1992). Dramatic postwar episodes from these soldiers’ lives are published at a site of the Warsaw Rising Museum, e.g. : http://www.1944.pl/historia/powstancze-biogramy/Piotr_Abakanowicz. Official memory had not recognized the Poland’s Home Army befittingly, nor had it honored the efforts of the Home Army’s soldiers. Also shunned were the achievements of Polish soldiers on the battlefields of WWII when they were not “politically correct”. Poland’s schoolbooks were therefore full of lies, and the publications that appeared were intended to showcase the role of the Polish People’s Army (formed in the USSR under Soviet auspices) in the “liberation” of Poland from the Nazis. Television, then making its début, was also doing its part to strengthen the vision of history the authorities were foisting on the population. Fig. 8. 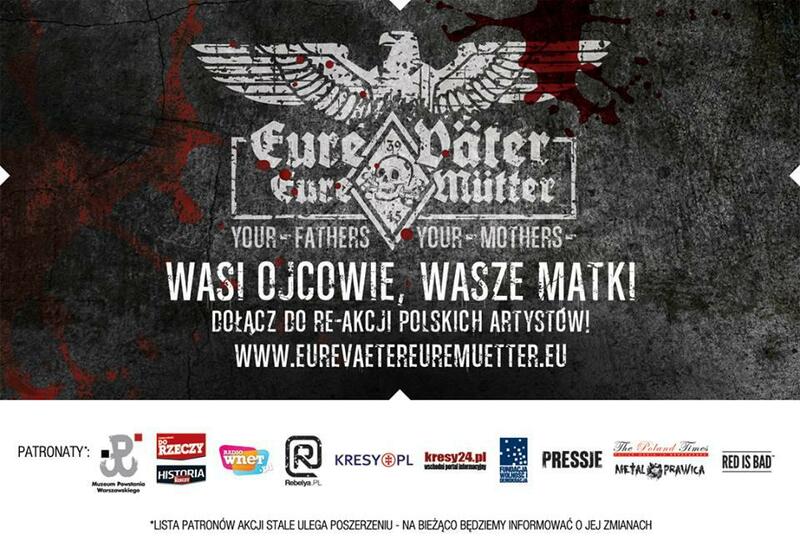 A picture–appeal to the surfers: “Join us, the Polish artist, who express their reaction to TV series Unsere Mütter, Unsere Väter”. Fig. 9. One of pictures sent to the appeal mentioned in the figure 8. Fig. 10. The poster prepared on the basis of the 1939 anti-nazi propaganda as a protest to the presentation of the series Unsere Mütter, Unsere Väter” by Polish public television. The question is: TVP – it is Polish or German television?”. The pictures presented above, clearly express the reaction of the surfers surprised and furious because of the broadcasting by Polish television TV series Unsere Mütter, Unsere Väter. The mechanism of propaganda in nowadays media can treat the fictional story, however far from historical truth, as another bestselling idea. In the collective memory could be treated as “another voice” in discussion on WW2. Thus, the artists and common users would like to remind that Germans were the aggressors and their actions during WW2 caused a lot of suffering to the occupied nations, and nowadays popular media discourses – even German one – seem to forget about it. In the 21st century, in the era of convergence culture, all media contribute to shape collective memory and common attitudes to history and chosen events, chosen heroes. In the public discourse new issues occurred as troublesome to popularize the truth about history which engaged not only Polish but also other nations. Some journalists, mostly those connected with the right wing of political scene, write that we, the Polish, “are losing the battle on history” (http://www.deon.pl/wiadomosci/komentarze-opinie/art,602,przegrywamy-walke-o-historie.html). The articles on that topic always have vivid reaction from the surfers (http://www.deon.pl/forum/temat,3,37779,2.html). The saddest and most worrisome (as well as irritating) issue is connected with cliché “Polish concentration camps” of unknown origin. Instead of writing about German concentrations camps built on the territory of occupied Poland, some journalists and politicians use the above cliché. The phrase is so “popular” in international media discourse that during 2012 representatives of our government 120 times protested against that usage8. In the appendix there is an article on that topic. Even in German popular internet discourse one can find the mentioned phrase as “Polnische Konzentrationslager” even when the material about the Auschwitz is discussed (http://www.youtube.com/watch?v=vSJeBL3E-vE). How to deal with that? How to convince the international public opinion that Poland is not responsible for Holocaust? 1. The Internet discussions cover a little of historical material available in the Polish language web. There are separate museum sites or events pages which do not provide the space for discussion (as it was mentioned before). Middle Ages, Renaissance and the heritage of Polish architecture, fine arts, literature, everyday life is of high touristic interest in Poland. Tourism of 21st century means a lot of interactive activities in the museums or other places connected with history, events just like reconstructions of some battles (such as a battle of Grunwald, July 15th, 1410) or “archeological picnics”, festivals and fairs organized in the historical locations (e.g. Biskupin, a Slavonic settlement built before 800 BC: http://www.biskupin.pl/asp/en_start.asp?typ=14&submenu=307&menu=307&strona=1). Reconstructions are important in Polish cultural life. Many of them are connected with WW2, for instance with the September Campaign of 1939: http://www.rekonstrukcje-historyczne.pl/mlawa-1939/; http://www.bzura1939.dobroni.pl/media/index.php?MediumID=9. The special milieu of reconstructors advertised activities of the groups devoted to historical performances in the net. Some of them specialized in different historical epochs from ancient times to 20th century (e.g. http://www.dobroni.pl/), but some have got not so broad interest and focus on one epoch (e.g. two groups devoted to the WW2 issues: http://www.czata49.pl/site/; http://www.festungbreslau.wroclaw.pl/main.php?target=wydarzenia). To sum up this topic, the interest in sharing opinions in the Polish language sites in the net is focused mostly on the 20th century, although the other times are interesting for the public in media such as museum, or in some forms of entertainment based in real space of the city or village rather than in cyberspace. 2. Attitudes of the surfers to the other users identified on almost all fora could be categorized as follow: erudite, historian-amateur, mentor (preceptor), patriot, “evangelizer”, emotional bomb, sentimentalist, happy ignoramus, self-confident ignoramus. “Erudite” is an attitude represented by somebody who put a comment with a lot of details and also unknown or less known information. Usually these users do not participate in the sharing opinions, they only provide a stimulus for discussion. “Historian-amateur” also put some posts on a given forum, but the informational value of this material is rather small. In posts one can find obvious information or emotional opinions on some events, persons or objects; however, it is evident that the user likes history. “Mentor’s” attitude is popular on historical fora, some users would like to correct mistakes they found in the posts of the other surfers. They always very eagerly explain the circumstances and context of the events and always answer the questions of the others (even very childish or “stupid” ones, posted by e.g. “happy ignoramus”). The goal of that attitude seems to be teaching and popularizing historical knowledge. Another attitude – “patriot” – is characteristic to the users who represent a lot of interest in Polish national history, and always try to underline their Polish origin and convince what an honor is to be Polish. Sometimes “patriots” use Polish symbols as their icons. “Evangelizer” could be identify as a person who would like to talk about religion despite the discussed topic. This attitude is really rear, but if such a user like to “convert” everyone, she/ he tries to do that persistently and other surfers try to block her/ him. “Emotional bomb” attitude occurs quite often in the discussions in the Polish language web; this attitude is self-referential, the user takes everything what is discussed personally. Even neutral information can cause “an explosion” of negative emotions. These users do not see or understand irony in the background of some comments, so they always overreact and redirect the discussion to peripheral, completely unimportant issues. User who can be identify as “sentimentalist” also presents emotional attitude, but in this case emotions are not so strong and generally positive. They use the history for talking about “the good old days” and their own or their families experience. The last two categories of users’ attitudes towards history and discussion could be quite important for the others – “happy ignoramus” and “self-confident ignoramus” can provoke a vivid discussion by posing a silly question or sending a post with evident mistakes. Ignorance could be the social game here. Forum provided by TVP Historia9, one of Polish public television channels, could serve as an example of good manners in the Internet. All discussions are really concrete and devoted to subjects mentioned in the television programming. People exchange thoughts and ideas about history, sharing their emotional views and discuss preferences. Vulgarity is absent here! If somebody tries to present provocative statements on the events or historical figures, moderator at ones warns the respondent. Some forum users present the optimistic worldview and friendly attitude to others, in the case of harsh words occurring in interpretation of Polish past (e.g. once socialism was called “criminal system”) always somebody tries to pacify the furious surfer by statements like “we differ from each other”, “my truth is different from yours and it is OK”, etc. Of course, some discussions are really hot, however people here try to use acceptable and inoffensive language (sometimes we can read that “the statement is stupid” or “please don’t treat us as idiots”, but this sort of phrases does not constitute the personal attack on anybody). Sensations based on biographies of famous historical figures or „mysterious” or unexplained events. In general – in the Internet discourse the history of Poland is more popular than the world history or the European history. Some periods, such as WW2 are still inspiring not only for scientists and writers but also for “ordinary people”. However, in the popular discourse history is more emotional than rational issue. Babbie Earl, 2011, The Basics of Social Research, Wadsworth, Belmont, CA. Ciechanowski Jan Marian, 1992, Na tropach tragedii. 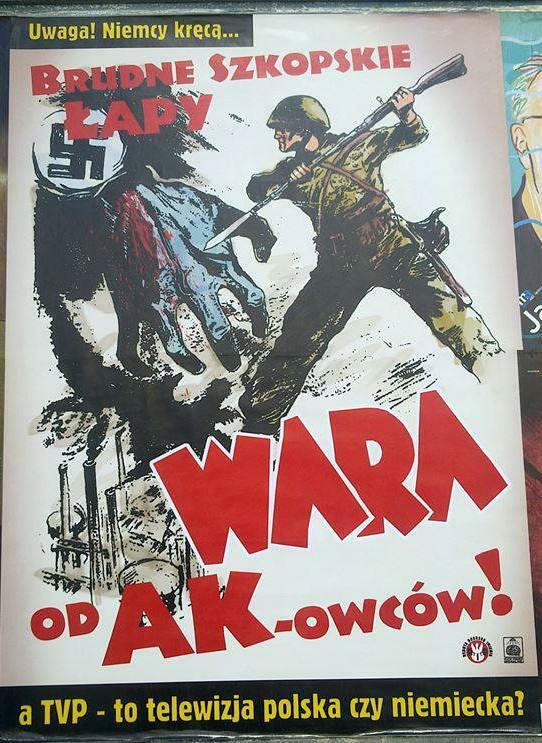 Powstanie warszawskie 1944: wybór dokumentów wraz z komentarzem, Warszawa. Cohen Stanley, 2001, States of Denial. Knowing about Atrocities and Suffering, Polity Press, Cambridge-Malden. Davies Norman, 2007, Europe at War 1939-1945. No Simple Victory, Palgrave Macmillan, London. Gluza Zbigniew, Marta Markowska et al, 2009, Rok 1939: rozbiór Polski, Fundacja Ośrodka Karta, Warszawa. Halbwachs Maurice, 1992, On Collective Memory, transl. Lewis A. Coser, The University of Chicago Press, Chicago-London. Jankowski Stanisław M., Edward Miszczak, 1990, Powrót do Katynia, KAW, Rzeszów. Mackiewicz Józef, 1989, The Crime of Katyn. Facts and Documents, Polish Cultural Foundation, London. Markert Wojciech, 2009, „Inwazja 17 września”, in: Katyń i okupacja sowiecka, [II wojna światowa. Wydarzenia, ludzie, bojowe szlaki, vol. VII] New Media Concept, Warszawa. Melak Stefan, 1989Katyń – synteza, nn. Sawicki Jacek Zygmunt, Tomasz Stempowski [eds. ], 2010, Oblężenie Warszawy w fotografii Juliena Bryana. Siege of Warsaw in the photographs of Julien Bryan (edition with DVD), Wyd. IPN, Warszawa. Strzembosz Tomasz [ed. ], 1996, Bohaterowie „Kamieni na szaniec” w świetle dokumentów, Wyd. Naukowe PWN, Warszawa. The Katyn Forest Massacre. Final Report of the Select Committee to conduct an investigation and study the circumstances of the Katyn forsest massacre, 1988: pursuant to H. Res. 390 and H. Res. 539. (82nd Congress, 2nd Session), Committee on House Administration United States House of Representatives, U.S. Government Printing Office, Washington. Fig. 11. 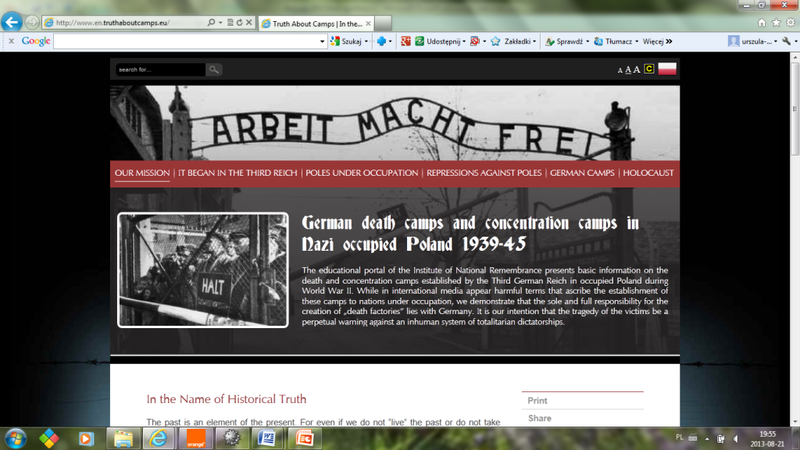 The print-screen of the IPN portal on German death camps located in occupied Poland and the beginning of the below article is also visible (http://www.en.truthaboutcamps.eu/). The past is an element of the present. For even if we do not “live” the past or do not take particular interest in it, the echoes of past events frequently resound in our own times. This includes when politicians talk about the past, when newspapers write about it, and when it becomes the subject of films and public debate. This is how the past is “contemporized” and becomes a part of our lives. But do we conceive the past in accordance with historical truth? Do we not distort it due to lack of knowledge or other reasons? …the German Concentration camps were born not in Polish territories, but in the Nazi Third Reich in the 1930s. The phrase “Polish” extermination or Camps where immediate mass extermination took place, chiefly of Jews and Roma. The largest death camp in Poland was the concentration camp Auschwitz-Birkenau. Other death camps: Bełżec, Treblinka, Sobibór, Chełmno nad Nerem (Kulmhof).death camps, which appears from time to time, is a glaring example of the distortion of truth about the past, that is, of historical truth. This phrase suggests that Poles were the creators and administrators of such camps. It is altogether understandable that this phrase is strongly opposed in Poland — a country that suffered so much during World War II. For those camps were established when Poland was occupied by the Germans. And the Germans were their creators. They administered them. They are responsible for the death and suffering of the millions of people who went through those camps. This truth so obvious in Poland, should become internationally recognized. In German-occupied Poland there were no (nor could there be) any “Polish” extermination, death, or (Konzentrationslager) – Concentration camps were established in the Third Reich beginning 1933 as detention centers for “enemies of the Reich” arrested on a mass scale. Apart from direct annihilation, the prisoners were destroyed by slave labor. It was in the concentration camps that the extermination program of certain categories of prisoners was carried out, for example the Jews or Roma (Gypsies).concentration camps. The German occupier established the camps to execute his criminal policy of extermination or enslavement of people of various nationalities – including Poles. The Institute of National Remembrance (Instytut Pamięci Narodowej, IPN), whose duty is to disseminate knowledge on Poland’s recent history, cannot remain indifferent with regard to the fact that this historically incorrect phrase of “Polish” death or extermination camps, which is so offensive to Poles, reappears in various speeches and publications. Thus, we have created the “German Camps in Poland” website within the framework of our mission. Its clear message is the historical truth that there were no “Polish” extermination, death, or (Konzentrationslager) – Concentration camps were established in the Third Reich beginning 1933 as detention centers for “enemies of the Reich” arrested on a mass scale. Apart from direct annihilation, the prisoners were destroyed by slave labor. It was in the concentration camps that the extermination program of certain categories of prisoners was carried out, for example the Jews or Roma (Gypsies).concentration camps. Those were German camps, for they were established and administered by the Germans, who governed occupied Poland via terror. The phrase “Polish” extermination or death camps, which appears from time to time, is a glaring example of the distortion of truth about the past, that is, of historical truth. This phrase suggests that Poles were the creators and administrators of such camps. The website consists of texts supplemented with iconographic materials. The first one illustrates the obvious truth that the German (Konzentrationslager) – Concentration camps were established in the Third Reich beginning 1933 as detention centers for “enemies of the Reich” arrested on a mass scale. Apart from direct annihilation, the prisoners were destroyed by slave labor. It was in the concentration camps that the extermination program of certain categories of prisoners was carried out, for example the Jews or Roma (Gypsies).concentration camps were born not in Polish territories, but in the Nazi Third Reich in the 1930s. The Germans transplanted the camp models they had developed in Germany onto Polish territories, modifying them to suit their new purposes. The next two articles show the dramatic situation of Poles under the Began with the German invasion of Poland on September 1, 1939 and lasted until the arrival of the Red Army in Poland (1944–1945). It was a period of terror and mass extermination of the civilian population and prisoners of war.German occupation. Having read them, the reader will soon realize that there were various “Polish” elements of the occupation-period reality (for example, the Polish resistance movement) in the occupied country, but there were certainly no “Polish” camps. The texts about the German camps in Poland show that the Germans created a camp network in the occupied country. Aside from the best known camps there were also other, less known ones which should be remembered. The last text talks about the Holocaust, for the German Camps where immediate mass extermination took place, chiefly of Jews and Roma. The largest death camp in Poland was the concentration camp Auschwitz-Birkenau. Other death camps: Bełżec, Treblinka, Sobibór, Chełmno nad Nerem (Kulmhof).death camps played a key role in it. We hope that the website we are launching on the anniversary of Nazi Germany’s invasion of Poland will meet our expectations and contribute to the elimination of the phrase “Polish” Camps where immediate mass extermination took place, chiefly of Jews and Roma. The largest death camp in Poland was the concentration camp Auschwitz-Birkenau. Other death camps: Bełżec, Treblinka, Sobibór, Chełmno nad Nerem (Kulmhof).death camps which misrepresents historical truth. 1 This magazine is „a clone” of internationally edited materials prepared by „Focus” press: „Focus. G+J International Magazines GmbH” brand located in Hamburg, Germany. 2 „Polskie dzieje” means “Polish history”, although the word “dzieje” is more sublime than “historia”. 3 Hereafter referred to using its Polish acronym – PRL. 4 The data were collected up to August 20th , 2013 – statistical data are prepared by moderators and based on the results visible then. 6 The documentary was filmed in 1939 and directed by Bryan himself, edited by Frederic Ullman Jr and Frank Donovan, 1940. Film Siege was nominated for Oscar award in 1941 in category Best Short Subject (One-reel) (http://web.archive.org/web/20120201205602/http://www.oscars.org/awards/academyawards/legacy/ceremony/13th-winners.html). 7 The three partitions of Poland occurred in 1772, 1793, and 1795, when Russia, Prussia, and Austria successively dismembered Poland, ultimately removing the entire country from the map. 8 The data from the internet issue of daily “Rzeczpospolita”: http://www.rp.pl/artykul/1055856.html. 9 As far as the topics are concerned, the TVP Historia forum reflects the programming of the television channel. During the period of gathering data the most popular were topics connected with WW2, including the Holocaust, and the Polish People’s Republic era. Some other vivid discussions exploded around the process of Polish independence in 1918 and the war of 1920. Analyzing the content of posts one can identify politics and morality as leading motives.